Anyone who knows me, will know that the bag of food is what I was most excited about. I confess, I enjoy eating! BOL!!! 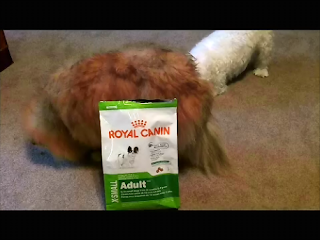 Royal Canin has a new food! Made specially for extra small dogs! To celebrate their new food, they are hosting The Royal Canin Treatment Sweepstakes! One lucky pup (entrant) will win free food and grooming for life! They are also giving away a shopping spree and there is an instant win game you can play! The Sweepstakes runs through June 1, 2012! she planned a doggy spa day for Baron and me. BOL!! I know, bath time isn't exactly my favorite activity. We went to Baron's house and his dad gave us both a bath with the new shampoo, grooming lead, and towels. I put the bath photos in the slide show below. Now, let's talk about my favorite thing, food! Royal Canin is made in the USA. The X-small formula is designed to appeal to the fussy appetites of extra small dogs. The kibbles are extra small to fit the jaws of tiny dogs (dogs weighing 8 pounds or less). It has dental technology too! 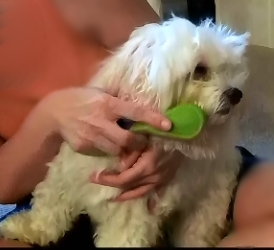 Mom is happy it has EPA and DHA in it to help keep our fur and skin in good condition. It also has ingredients in it to keep our digestive and urinary systems healthy. After the bath, mom used the new toothpaste and brush to clean my teeth, another activity that isn't on my list of favorites. BOL!! Thankfully the 3-sided brush made it fast. Next we had our nails trimmed. I sure hope mom does it right, that is usually the groomer's job. The nice, soft, little brush felt good on our faces. Our spa day ended with a great meal! Is it time to eat yet? It smells really yummy! Yes, please put some in my dish. Finally, we received our reward for being good dogs during the grooming session. Yummy!! We love the taste and small kibble size. It's no surprise that I love it, but Baron, who is very picky, loves it, he wants more. Here is a photo where you can see how much smaller the Royal Canin X-small kibbles are compared to regular size kibbles. The Royal Canin ones are the small ones. The four larger kibbles are from four different foods. I love when I get fun mail! Especially when there is food in it! Baron's mom was particularly excited to see the wipes, he has allergies and she has to wipe the pollen off his feet every time he goes outside. Yes, I share my goodies with Baron. I suspect mom may make me share with Amanda and Bailey when they are older. I'd like to hear all of you bark (confess), are you a food lover like me, or a picky pup like Baron? Do you have a favorite kibble size? Do you love bath time, or try to hide? How do you feel about having your teeth brushed? Maya & Pierson love food. Both are super-easy to train because of their high food-drive. The bigger bites are better since both are big dogs. They tolerate baths, nail clipping, and teeth brushing very well but I can tell by their sad puppy-eyes that they don't like these activities one bit. I will have to look into getting one of the 3-sided toothbrushes. Hi Dawn, Thank you for visiting my blog! High food-drive does make training easy! I will do just about anything for a treat! Maya and Pierson sound wonderful! Pepper, this was the best review EVER! The food looks delicious, and I am a picky one like Baron. I also hate the bath, but if the shampoo is good for my itchy skin, it would be well worth it to Mom. I have to enter the sweepstakes, too, because I would love to win a pawsome package like this! 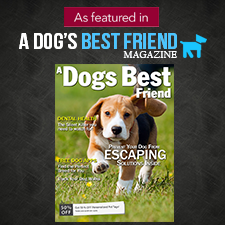 Thank you for keeping the doggy world informed and showing us the great products out there!!! Hi Romeo! Thank you! I think you would like this food. Oatmeal shampoo is nice and gentle. Good luck in the sweepstakes! Great review Pepper. We love food, but being Rotties I think this particular one is a bit small - we like BIG kibble. BOL - even our cats like to steal our big kibble. The wipes and the shampoo sound good though. Seany, our cocker spaniel brofur, is sensitive, so oatmeal shampoo might be good for him. And the wipes would be good for face cleaning inbetween baths. Hi Freya! Thank you for reading my blog! BOL!! I guess little kibble would be difficult for Rotties to chew! They make food with normal sized kibble too. I think the oatmeal shampoo would feel good to Seany. The wipes are so convienent! We love them! Very nice Pepper! Wonderful job! That three sided brush seems really nice. I'm going to have to let Mom check that out. Hi George! Thank you! That three sided brush is great, I like it because it is smaller than some others I have tried, and you know how small our Pommie mouths are. The toothbrush came in an Oral Care Kit from Tropiclean for small dogs. I think that means they probably also make a size for larger dogs. So when you find one, check the package to be sure it is the small one. I think you will like it, the kit also has tooth cleaning gel and a finger brush in it. Thanks for a great review. 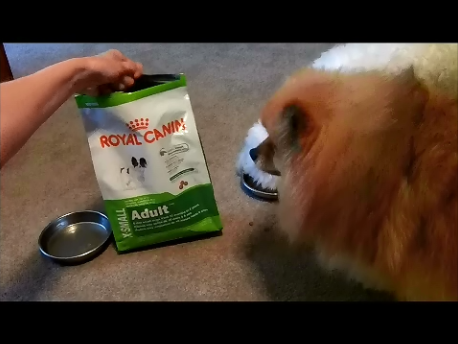 My pom is extra picky and finding a small bite food can be challenging. 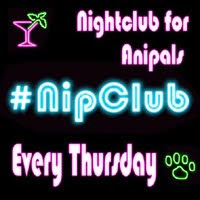 I am also interested in the micro fiber pet towels. 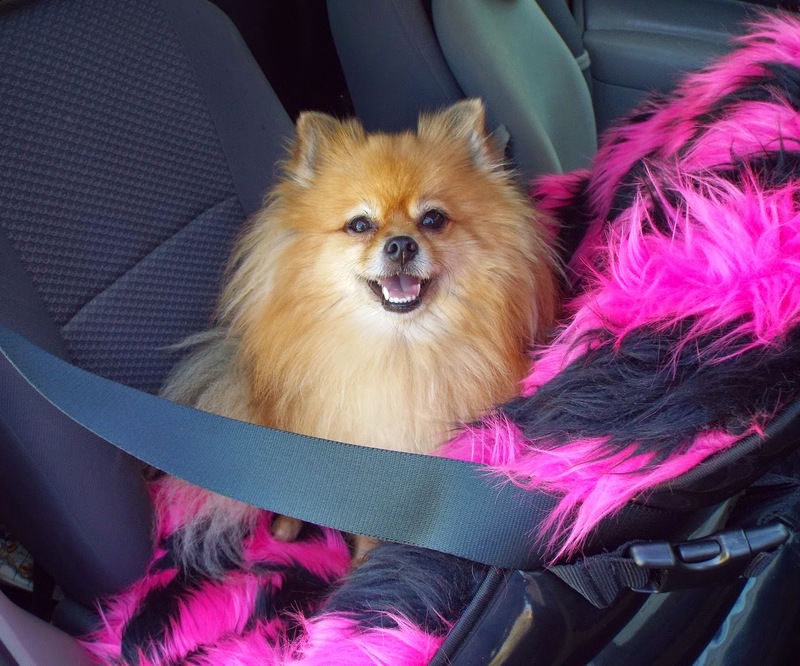 I hate it when the pet towels get mixed up with the shop towels because my pom also has sensitive skin. I can't wait to try some Royal Canin small bite food for my fussy eater. 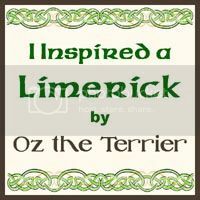 It is nice to know that another dog has tried it and liked the product. Thank you for visiting my blog! 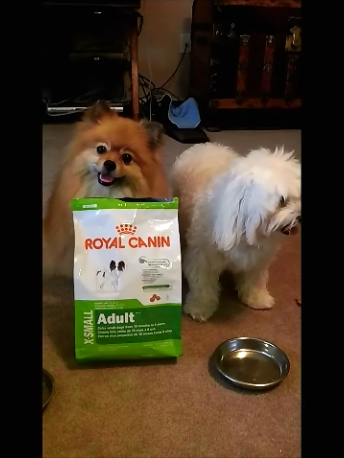 I think your Pom will like the Royal Canin X-small food, the kibbles are really small and flavorful. Baron is still loving it after a week, and he usually gets bored with a food after 3 days. Oh Dog! A gift that included a bath? 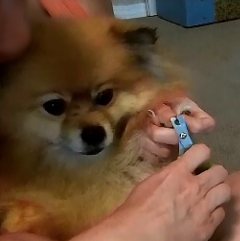 And a nail trim? uh... I dunno about that! Hi Rumpy! Thank you for visiting my blog. BOL!!! At least I had a pal in the bath tub with me, misery is less miserable when shared, and fun is more fun when shared. Either way, having a pal makes everything better! BOL!! Great review Pepper! Mom is excited about the wipes. She just started using baby wipes for my paws because of my bad allergies, so if there are some made just for us pups that would be better! Thank you Buddy! I am sorry the allergies are bothering you, Baron has to get his paws wiped too. I hope you feel better soon!